There’s no better way to show your love of mechs and other people than by covering your big stompy metal suit with huge sloppy, lipsticky kisses. Till now such a thing has required a giant pair of novelty lips and, well, your own 60 tonne metal death machine. 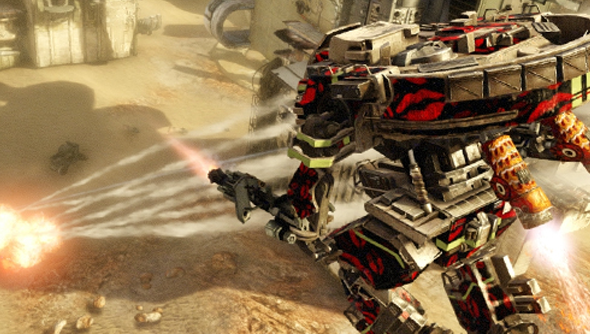 Happily for us Adhesive games have now allowed you to do such a thing in their free-to-play mech game Hawken. It’s all part of their Hearts on Fire Valentine’s day update. If legal tender isn’t your thing or your coffers are somewhat depleted of late then you can usethe four new skins till the 19 February for freeor slap down some money and buy the camos permanently. They’re only on sale till the 26 February though so you’ll need to hop to it if you don’t want to miss the opportunity. Check the skins out for yourself over yonder. Thanks for the heads up, PC Gamer.